The risks that lurk inside our grimy bins are seldom known and often overlooked. 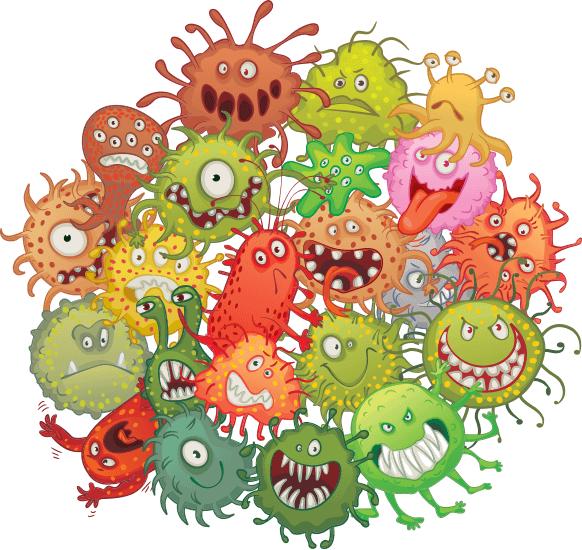 Every single time we touch the bins to dispose of trash and recycling we are exposed to a host of harmful germs, bacteria and fungus. Maggots, mosquitoes, ants, wasps, mice, rats and raccoons (as well as their feces) are also commonly found inside the bins. Without proper hand washing immediately after bringing our bins in, you can spread risky bacteria throughout your households. As a family-owned trash can cleaning business, we hold our community’s health at the forefront of our mission to clean and sanitize this commonly overlooked source for sickness and disease. Bins Be Clean is a local, family-owned and operated trash can cleaning business. 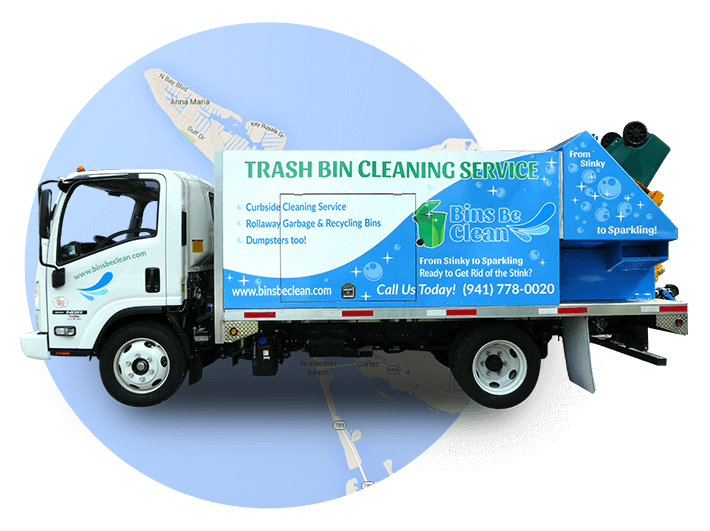 We provide services for all residential and commercial roll-away bins and dumpsters on Anna Maria Island, Lakewood Ranch and Bradenton. Our trucks run routes that follow the garbage trucks, allowing for bins to be cleaned after they are dumped and before they are taken back to the house or garage for storage. We use only Green-Seal Certified chemicals, along with extremely high pressure and high temperature water in our 100% contained trash can cleaning system to ensure that zero waste water is left behind to contaminate the local vegetation and water sources. In addition, the removal of waste water means kids and pets won’t be exposed to dirty water. It is also important to us to protect the environment as we grow as a business and clean more and more cans. Our trucks are equipped with reservoirs for contaminated water separate from the fresh water we use to clean each bin. We dispose of this water in sanitation sewage facilities. We use extremely high pressure in our spray guns in order to minimize the amount of water needed for each bin (approximately 1-3 gallons). Our trash can cleaning system heats the water to over 180° in order to kill harmful bacteria with heat and minimize the need for degreasing chemicals. The need for scrubbing brushes that harbor bacteria, harsh/toxic chemicals that harm the environment, massive amounts of water and elbow grease is virtually eliminated by keeping up with a ROUTINE MAINTENANCE PROGRAM monthly cleaning service. 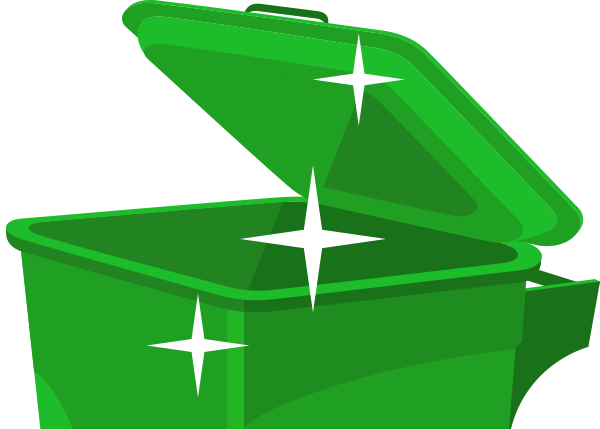 We bring peace of mind to the families and businesses of our community by eliminating the chore of cleaning garbage bins from the list and protecting our environment at the same time.